Operate a Regional Jail Facility Housing for Yankton Sioux Tribe, Bureau of Indian Affairs and 18 other Counties. 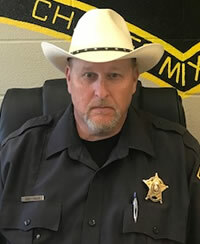 Sheriff Randy Thaler became the Sheriff in Charles Mix County in January of 2011. He has spent over 25 years in law enforcement. He is a graduate of the Military Police Academy and served as a Military Police Desk Sargent and Military Police Squad Sargent. Sheriff Thaler is also a graduate of the South Dakota Law Enforcement Training Academy and South Dakota Trooper Academy. He served five years as a Charles Mix County Deputy and eleven years as a South Dakota Trooper. As a certified law enforcement officer he has attended numerous accident reconstruction courses, he is a firearms instructor, as well as an emergency vehicle operations instructor. Sheriff Thaler is a member of the National Sheriffs Association, South Dakota Sheriffs’ Association, and South Dakota Trooper Association.